Great Pizza and Family Fun! Fresh, homemade pizza crust dough topped with delectable sauce, premium meats, fresh veggies and cheese – and don’t forget Sandy’s signature sweet red peppers! Whether it’s a quick lunch or a pizza party, you’ll love the fun atmosphere, local decor and great food. Both locations are just a short drive from Evansville & Owensville, In! 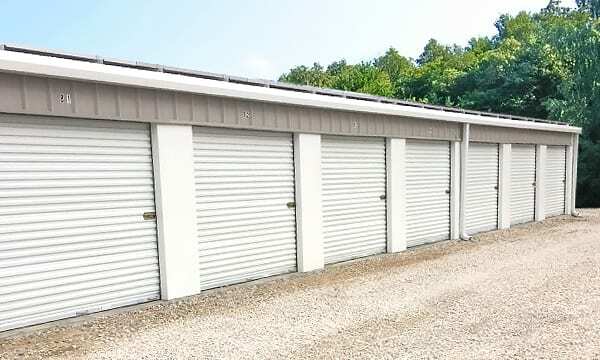 Check Out Our Variety Of Storage Units. Lowest Prices Around! Great atmosphere and even greater pizza. I ordered the all meat with the "sweet reds" (red peppers) and it was delicious. The crust was thin and crispy and the pizza was baked to perfection. Being from out of town and eating our local pizza, this is definitely a nice change from our usual pizza. Sandy's is a place you should give a try, because you'll come back often. Oh, and our server was excellent too. Her recommendations for the pizzas we ordered made a huge difference. Fantastic pizza, I usually only get down there 1 time a year but when I do I always go to Sandy's. The pizza is great and I buy a jar of the red sweet peppers everytime to put on other restaurants pizza. By far the best pizza in the area. Take out is much better than the buffet. The all meat pizza is awesome. I last ate there 4 years ago and still have not found better pizza anywhere else. Just had a pizza delivered and it's amazing thank you guys so much for the short waiting time and great service!!! Worth the wait! Great pizza and friendly staff, definitely a favorite if you're looking for the local restaurant. Great pizza and a really cool atmosphere. Friendly staff and service is pretty quick. One of the best pizza joints in Southetn Indiana, or anywhere for that matter. Amd leftovers are just as good the next day! They were busy as can be but the service was still great and everyone was friendly! They have the best pizza and sides ever! If you want great food and a great hometown atmosphere Sandys is the place to go! The particular pizza sauce they use is the exact taste I love. Sweet red peppers are like candy. The service is professional and the people are warm and friendly. The thing that stands out with this establishment is the decor and atmosphere. I would live inside it if I could! Unique interior...there's vintage things all over the walls and ceiling. Kids of all ages love the ice cream machine...self-served. Salad bar is great. Daily lunch buffet. Dinner buffet Tues and Wed nights. Id say most people develope a craving for their sweet red peppers. Barbecue Chicken pizza without the jalapeños is my favorite. Give this place a try. Great pizza and pasta. Fast service, freindly people, and interesting decor. Decent prices also. Highly recommended. I love the pizza here. Make sure that you order one with the sweet red peppers... They are amazing. The best lunch pizza buffet ever!! Pizza was fresh, delicious and fast service!! Great atmosphere too. When you go try the the root beer in the barrel! The best root beer you will have. Amazing pizzas. We had a small combination pizza, 2 salad bars and 2 drinks for about $20. The people there are super. The food is amazing and worth the money. Would very much recommend this place to eat at. Best pizza in the area with fun & homey decor. If you are in the area a must go. We got there with only an hour left for the buffet and 4 hungry girls. They asked what the girls wanted and made it for them. Salad bar was nice with fresh veggies. The food and the service was great. Great atmosphere. Great service and best pizza ! I Always enjoy coming here with family when i visit for the holidays . Best pizza in the Tri-State area! We eat here every time we visit our family in Owensville. The inside is cute with old signs and lots of broken clocks. We love the crust and the sweet red peppers are delicious! Pizza was good and the staff was friendly. Takes a little while to get your food but worth the wait. The atmosphere is great and food I'd phenomenal! Would definitely recommend this nice down home pizza joint! I always enjoy going to Sandy's. They have a great atmosphere. They also make some of the best pizza's and strom's in my area. Nice local restaurant with a good atmosphere and delicious pizza. Have ate here several times and it is always a clean fun environment. Love all the nostalgia hanging all over the place and of course the pizza pies and other food are the best around. Keep up the great food!! Fun family pizza place. Great buffet, we will definitely be stopping in on our next trip to the area. Helpful staff with unique pizza. They will make whatever you would like on buffet nights. Quality ingredients. Best pizza ever. Roasted red peppers are great. My favorite pizza on the planet. Nice Local Pizza Place--Always very busy--they have buffets, and you can order from a large menu, along with free refills and ice cream. It is a nearby, very good local pizza place. Don't miss their pizza with the cherry peppers! Today I tried the Sunday buffet. Great ice cream and selection of pizza. I also enjoyed the root beer that they had on tap. Though the food was good I did have a issue locating the correct public entrance to the building. After that I did not find a sign posted stating if I should wait to be seated or even be greeted before begining the buffet. Once I approached a employee they were friendly and took care of me. I enjoyed the atmosphere with multiple TV's that provided different sport stations. I'd suggest this local brand over a national chain. Good pizza! Love the sweet red peppers! The root beer here is wonderful! Amazing pizza. Sausage and sweet red peppers is probably my favorite. Kind staff. Buffet style service with a friendly happy attitude. Lots of neat stuff to look at in this place. Always good, love their cheese/steak pizza. We ordered online. Online said our pizza was ready, but it was not when we got there. However, it did come out fairly quick and was hot and good. I asked for mine well done, and it did not come well done, but it was still pretty good. This is not our go to pizzaplace, but it is nice for a change every once in awhile. Love love LOVE the sweet red peppers!! BEST PIZZA IN PRINCETON & Ft. BRANCH!!! Being pregnant, wanting what I want is kind of something that happens. I decided I wanted a Stromboli, and was set to get it. It was about 9pm, I called & was told that they would be open until ten for customers, and 11 for businesses. I tried to call at about 9:20 and didn't get an answer. I ended up driving there, pulled in with an open sign. I parked and walked to the front and they had shut all of the lights off. It was about 935. The young lady in management that night, Kayla, opened the door and told us they had to close due to labor costs and not getting enough business that night. I completely understood, and explained to her I had called and was told they would be open until 10 for customers and 11 for business. She asked what we were wanting, I told her two Stromboli's. She very kindly told us she would make them for us, and to come inside and we could pay and get the food. I was very impressed with the service and she was extremely kind about the situation. Thank you, Sandy's Princeton! We will be back again! And as for Kayla, I was told she was new to management, and I am very impressed with the was she handled that situation. Well trained and very sweet. They are my go to pizza on Monday and Tuesday and a huge plus is they deliver to Oakland city!! They make a good solid pie and there crust holds up good to multiple toppings that would "break" a wimpy crust. It's been three weeks since my first review tonight got the large pie double cheese, double pepperoni, mushrooms and extra sauce ( if a place has a great tasting sauce always get double sauce it helps carry all the flavors, also makes for the best day after pizza because all the sauce doesn't " dissappear" into the crust had it cooked well done. Dang good pie. Tonight also got the 12" grinder for the first time and it's a darn good sandwich but I would make it with cheese on the bottom and top to help keep all the toppings encased in that fantastic dairy gooeyness because they really load this mother down. Good quality ingredients, fast delivery, not skimping on the toppings and most importantly their employees generally seem to be positive pizza people. The owner is a fantastic man and you'll receive fantastic service. The pizza is probably good too. Haven't had it yet, had to write this review first. Yeah the service is that fantastic. EDIT: The pizza is fantastic too. Better than what you get at the original Sandy's!! The Pizza is awesome, at a decent price. You have to try the 36 inch pizza!! Just a little bit ago I received a call from the store manager Julia, at Sandy's Pizza in Princeton, she called to apologize for not returning any of my calls. She explained the new procedures they are having to do with the new accountant and how instead of taking a few hours to get an answer it now can take up to a few days. All is forgiven, as I said before this was never about the quality of the food it all had to do with how I was treated by the store manager. The discrepancy had been taken care of already so Julia, didn't have to call but she did and for that reason I will continue to do business at Sandy's Pizza!!! Please call Kaley Tooley, General Manager, at 812-677-1755 if you have any suggestions, comments, or complaints. We aim for 100% customer satisfaction! See what others are saying about us, or rate us and share your experience. Wanna make some dough? Learn about our fundraising opportunities. Have a great time at Sandy's Pizza? Share your experience on Facebook.